If you’re just remotely familiar with the term, you know it’s not a good thing. If you’ve never heard this term before now, it’s possible that you currently have some duplicate content on your website. Imagine that you’ve been working late into the evening putting the finishing touches on your new real estate website, and you wanted to showcase some of the subdivisions that you specialize in. Each of these areas need some written descriptions of what makes them special: good schools, great nightlife and recreation, low property taxes, and breathtakingly beautiful sunsets. However, you’ve never really considered yourself much of a writer; back in high school or college, business math and volleyball were really your strong suits. Out of curiosity, you do a quick Google search and see that some other local websites already feature some nicely-worded profiles of these areas. You then decide to copy and paste these descriptions onto pages on your own site – who will ever notice? You click “Publish”, reward yourself with a nice nightcap, and retire to bed. Perhaps a few months pass, and one day you receive an email from a lawyer representing the site that you’ve swiped the neighborhood descriptions from, with a cease-and-desist order demanding that the purloined content be removed immediately. In some cases, these notices may also ask for monetary compensation for the unauthorized use of said content, and if the amount mentioned in this correspondence is not paid within the specified time, you’ll also be liable for any attorney’s fees incurred to recover this settlement amount. In other words, the formal copyright requirements that once applied to dead tree books and publications do not apply to original content published online. Any media (including photos, videos, etc) published to the web is, for all intents and purposes, automatically copyrighted as long as it meets the criteria of being 1) fixed in a tangible medium of expression, 2) original, and 3) creative (all of which US courts have generally interpreted very loosely on the side of content creators). As such, unless that picture or blurb of text you intend to copy-and-paste is explicitly advertised as being free for public use, it’s a good bet that it’s not something you can use on your business site. In addition, content creators can pursue another option to reprimand content thieves online: filing a DMCA takedown notice to offending websites, their hosting companies, and search engines. Even if the site owner does not respond to the request to remove the content in question, the hosting company will likely shut down the site to avoid liability for contributory copyright infringement. Worse yet, search engines such as Google, Yahoo and Bing will – should they determine that claims of copyright infringement are valid – remove the site from search results, including paid ads. In this case, one of the omitted entries may be one of your site pages. Unless the user clicks on “repeat the search…”, your site may not be displayed within the results listed – and given the above wording of the message, it’s unlikely that they will (would you?). Contrary to popular belief, search engines do not impose any so-called “duplicate content penalty” per se, but the manner in which they refine their search experience for users can omit your pages from initial search results, and significantly detract from your online visibility all the same. If you are the original author of an article, Google will see it as such. If the article is found on a secondary site it might never get ranked by Google or, if so, ranked very poorly. View Matt Cutts from Google on How does Google handle duplicate content? When the shoe is on the other foot, and you come across someone using your copy or photos on their own real estate site, what steps should you take? To begin with, you can try contacting the site’s owners to remove the stolen content from their site. If the site’s owners fail to comply with your request within a reasonable amount of time, you can also file DMCA notices to the site’s hosting company and search engines. If you’re not certain how to word these emails, many stock letters and templates are available online (here’s one example). In case your curiosity has been piqued, there are numerous tools available online to check if your content is being used elsewhere on the web. We’d recommend using CopyScape.com, though there are plenty of other free duplicate content-checker websites out there, as well as some premium services that will also proofread your copy for grammatical and spelling mistakes. NOTE: it bears mentioning that the term “duplicate content” has evolved to mean many different things on the internet. Some articles you may find online when using the search terms “duplicate content” caution against the use of inconsistent URL strings when creating internal links. This is a topic worthy of its own discussion; in the interest of keeping things simple, we may address this in a future blog post. Obviously, potentially negative consequences aside, it’s always the better option to create original content. You want to offer an engaging and unique experience to your site’s visitors, so they have a good reason to keep coming back. Your site – and particularly your blog – is a fantastic showcase for the real estate expertise that you’ve acquired over the years, and this may increase the likelihood that other sites will link to yours (which can greatly benefit your site’s SEO). If you’re not sure what to write about, keep in mind that no one knows your market and your clients better than you do! Draw from your own experience, and consider what information would interest and appeal to your target market. If you still need help getting the ball rolling, we suggest you read our real estate blog on the topic of What to Write About. Some of our favorites are How to Write Neighborhood Profiles, Real Estate Blog Ideas – Your Resource Guide, and Marketing Yourself; What’s Your Story? 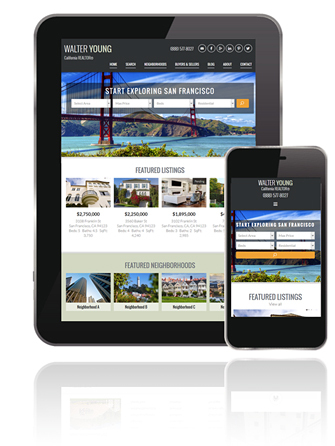 If you’re in the market for a powerful real estate website that gives you that online stage to showcase your knowledge and experience as well as be pleasing to the eye, then check out our responsive real estate websites – you and your clients will certainly notice the difference.